That book took him on a 250,000 mile journey. While traveling, he discovered historically unprecedented movements of Muslims to Christ. We are living in the middle of the greatest movement of Muslims turning to Christ in history. Dr. Garrison has been involved in ministry in the Muslim world for the last 30 years. He remembers the times when it was difficult to find any significant movement of Muslims to faith in Jesus Christ. But over the last 5 years, he and various organizations have noticed that something unusual has been happening. About 3 1/2 years ago a foundation asked that he investigate and discover what God is doing to bring Muslims to Christ. He said, “yes,” and it took 2 1/2 years and over 250,000 miles of travel. But what he’s discovered is astonishing. 84% of all movements of Muslims to Christ are happening now. The biggest barrier is that Islam is the only world religion that was tailor-made to defeat Christianity. And it did a good job for about 13 centuries, primarily using Sharia Law. All roads lead on to Sharia Law but no roads lead away from it. Yet, there are other barriers to people leaving Islam for Christ that have nothing to do with Sharia Law. Rather, they are barriers that have to do with our culture. As always, it all starts with prayer. Perhaps one way is to begin praying for Muslims during Ramadan. One resource Dr. Garrison suggested was 30 Days Prayer. There, you will find daily prayer targets as well as information about the Muslim world. When you pray, you take on the heart of God. Prayer originates with Him.
. And, like we mentioned above, it all starts with prayer. Further, we can begin supporting ministries that have been effective in reaching out. And, perhaps some will step into the darkness and minister themselves. God is bringing the Muslim world to us. There have been recent breakthroughs in how we can share our faith with Muslims. For example, Any-3: Anyone, Anywhere, Anytime — Win Muslims to Christ Now! is an excellent resource, as well as The Camel: How Muslims Are Coming to Faith in Christ! The Church Planting Movements website has several resources listed and available. We're starting where they are and bridging them into the New Testament. Dr. Garrison was kind enough to let me bring some questions from my friends and fellow listeners. Here are the questions they asked. Paul: Have you heard about dreams and visions with a man in white? Scott and Alan: What is the best way to start a conversation about Jesus with a Muslim friend without being offensive. 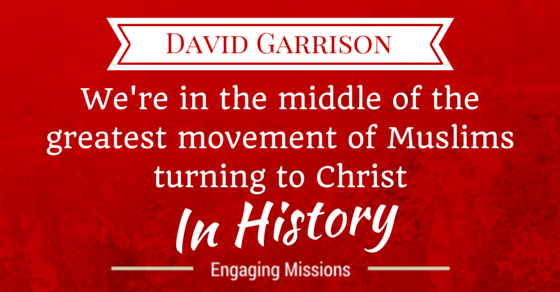 Dr. Garrison mentioned that Any-3: Anyone, Anywhere, Anytime — Win Muslims to Christ Now! answers the question about Christ-centered conversations well using the 5 Gets.